Again, 10-30 years old (or less) – fake imitation china ??? Hoping someone can help me identify the mark on this china set. Thank you for any opinion you might have. Comments for Again, 10-30 years old (or less) – fake imitation china ??? It is not that simple. The character style here is also wrong, generally said it is just an imitation put on as decoration. Real Qianlong period marks of this type are rare. The large majority uses a different character type. The color red makes it even more problematic, because few Qianlong marks were in red. Please upload pictures of the item and mark, if possible. 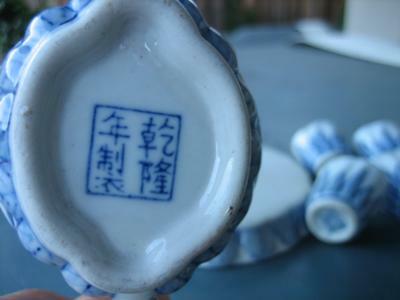 With Chinese items it is impossible to judge age or if an item is a genuine antique based on the mark. Throughout the ages marks were copied from earlier eras. I've been searching for this mark on the internet! My friend has a vase with this mark but in red with a double border. Is that called a cartouche? The double line border is not as straight, more irregular. Is that how the mark is suppose to be if it is original Qianlong Nianzhi? If you want to seek a second opinion, I recommend asianart_com or gotheborg_com. The latter has a collection of marks including newer ones and probably is the number one website for Chinese porcelain in the English speaking world. Yes, it exactly the type of mark I thought. It says "Qianlong Nianzhi" (made during the Qianlong years), but it is a late 20th century faux mark. Marks of the Qianlong use a completey different type of character. This mark looks like a modern handwritten seal stamp. Such marks are frequently applied to new ceramics, probably for decorative purposes only.